IBP-ELIBRARY: Are there varying interpretations of the prosecutors and the judges on Section 21 of R.A. No. 9165? Are there varying interpretations of the prosecutors and the judges on Section 21 of R.A. No. 9165? The prosecution bears the burden of proof to show valid cause for non-compliance with the procedure laid down in Section 21 of R.A. No. 9165, as amended. It has the positive duty to demonstrate observance thereto in such a way that, during the proceedings before the trial court, it must initiate in acknowledging and justifying any perceived deviations from the requirements of the law. Its failure to follow the mandated procedure must be adequately explained and must be proven as a fact in accordance with the rules on evidence. The rules require that the apprehending officers do not simply mention a justifiable ground, but also clearly state this ground in their sworn affidavit, coupled with a statement on the steps they took to preserve the integrity of the seized item. 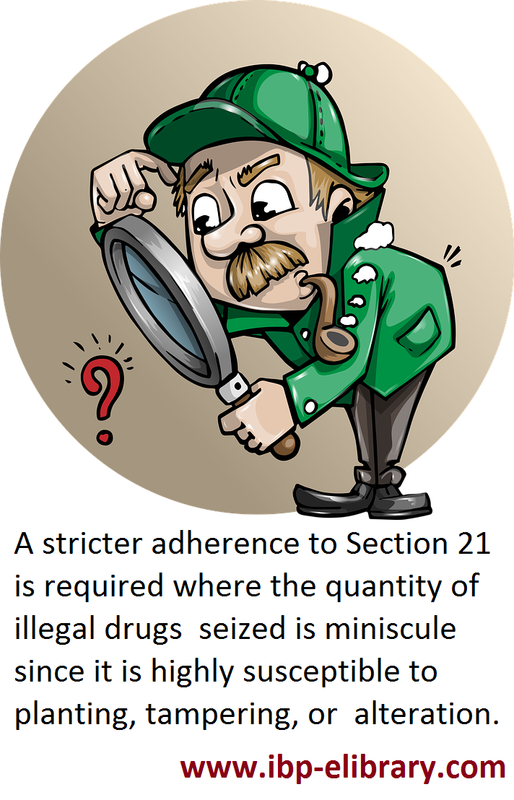 A stricter adherence to Section 21 is required where the quantity of illegal drugs seized is miniscule since it is highly susceptible to planting, tampering, or alteration. PEOPLE OF THE PHILIPPINES, PLAINTIFF-APPELLEE, VS. EMMANUEL OLIVA Y JORJIL, BERNARDO BARANGOT Y PILAIS AND MARK ANGELO MANALASTAS Y GAPASIN, ACCUSED-APPELLANTS. This is an appeal from the Court of Appeals (CA) Decision dated May 31, 2017 dismissing Emmanuel Oliva y Jorjil, Bernardo Barangot y Pilais and Mark Angelo Manalastas y Gapasin's appeal, and affirming the Decision dated October 28, 2015 of the Regional Trial Court (RTC), Branch 65, Makati City, convicting appellants of Violation of Sections 5 and 11, Article II of Republic Act (R.A.) No. 9165. The Chief of Station Anti-Illegal Drugs - Special Operations Task Group (SAID-SOTG), on January 23, 2015, received a report regarding the sale of dangerous drugs by a certain "Manu" in Barangay Cembo, Makati City and its nearby areas. As such, a buy-bust operation was planned and after coordination with the Philippine Drug Enforcement Agency (PDEA), a buy­bust team was formed wherein Police Officer 3 (PO3) Luisito Marcelo was designated as the poseur-buyer and given a P500.00 bill as marked money, and PO1 Darwin Catabay as back-up. Thereafter, the buy-bust team proceeded to the exact location of "Manu" after it was confirmed by the confidential informant. When they arrived at the target area, the confidential informant pointed to appellant Oliva as "Manu," the seller of dangerous drugs; thus, PO3 Marcelo and the confidential informant approached the said appellant. PO3 Marcelo was introduced by the confidential informant to appellant Oliva as a buyer who wanted to buy P500.00 worth of shabu. PO3 Marcelo handed appellant Oliva the marked money after the latter demanded payment. Appellant Oliva then showed PO3 Marcelo four (4) transparent plastic sachets with white crystalline substance and asked the latter to choose one. Meanwhile, two (2) other persons, appellants Barangot and Manalastas were also at the target area to buy shabu. Appellants Barangot and Manalastas, and PO3 Marcelo each took one sachet from the four sachets that appellant Oliva showed. Upon receiving the dangerous drug, PO3 Marcelo immediately scratched his chin, which is the pre-arranged signal to his back-up that the transaction has been completed. Subsequently, PO3 Marcelo grabbed appellants Oliva and Barangot and, thereafter, PO1 Catabay appeared and arrested appellant Manalastas. The police officers conducted a body search on appellant Oliva and it yielded another sachet containing white crystalline substance, the marked money and two (2) more pieces of P500.00 bills. Eventually, appellants Oliva, Barangot and Manalastas were arrested and brought to the barangay hall where an inventory was conducted and on the basis thereof, an inventory report was prepared. The confiscated items were then marked and photographed, and a request for laboratory examination was accomplished and the seized items were submitted to the PNP Crime Laboratory. The substance found inside the sachets were all tested positive for the. presence of methamphetamine hydrochloride, a dangerous drug. On the 24th day of January 2015, in the City of Makati, Philippines, accused, not being authorized by law and without the corresponding license and prescription, did then and there willfully, unlawfully and feloniously sell, deliver and distribute zero point six (0.06) gram of white crystalline substance containing methamphetamine hydrochloride (shabu), a dangerous drug, contained in one (1) small transparent plastic sachet, in consideration of Php500.00. On the 24th day of January 2015, in the City of Makati, the Philippines, accused, not being authorized by law to possess or otherwise use any dangerous drug and without the corresponding prescription, did then and there willfully, unlawfully and feloniously have in his possession zero point ten (0.10) gram of white crystalline substance containing methamphetamine hydrochloride (shabu), a dangerous drug. On the 24th day of January 2015, in the City of Makati, the Philippines, accused, not being authorized by law to possess or otherwise use any dangerous drug and without the corresponding prescription, did then and there willfully, unlawfully and feloniously have in his possession zero point five (0.05) gram of white crystalline substance containing methamphetamine hydrochloride (shabu), a dangerous drug. On the 24th day of January 2015, in the City of Makati, the Philippines, accused, not being authorized by law to possess or otherwise use any dangerous drug and without the corresponding prescription, did then and there willfully, unlawfully and feloniously have in his possession zero point three (0.03) gram of white crystalline substance containing methamphetamine hydrochloride (shabu), a dangerous drug. Upon arraignment, appellants, with the assistance of counsel, entered pleas of "not guilty" on all charges. All appellants used denial as a defense. According to appellant Oliva, on January 21, 2015, around 10:30 in the evening, he was in front of a neighbor's house when several armed men, riding in motorcycles, stopped by and invited him to go with them. When he refused to go, one of the armed men pointed a gun at him, handcuffed him, and forcibly took him to the SAID-SOTG office where he was detained. On the other hand, appellant Barangot maintained that on January 22, 2015, around 2:30 in the morning, he was having a drinking spree with one Mel and Nonoy when several men barged inside the house and arrested them. They were then brought to the SAID-SOTG office where they were detained, and subsequently, freed after Mel and Noy paid the police officers for their release. Appellant Manalastas also denied committing the offense charged against him and claimed that on the same date, he was inside his room sleeping, when he was suddenly roused by loud noises causing him to go outside and check the commotion. He saw armed men inside his house and, thereafter, the latter took him, his mother, a certain Bong, Ronald, Abby and two (2) boarders to the SAID-SOTG office where they were all detained. 1. In Criminal Case No. 15-195, the court finds the accused, Emmanuel Oliva y Jorjil, GUILTY beyond reasonable doubt of the crime of violation of Section 5, Article II, R.A. No. 9165 and sentences each of them to suffer the penalty of life imprisonment and to pay a fine of Five Hundred Thousand Pesos (P500,000.00). 2. In Criminal Case Nos. 15-196 to 15-198, the court finds the accused, Emmanuel Oliva y Jorjil, Bernardo Barangot y Pilais and Mark Angelo Manalastas y Gapasin, GUILTY beyond reasonable doubt of the crime of violation of Section 11, Article II, RA. No. 9165 and sentences each of them to suffer the penalty of imprisonment of twelve (12) years and one (1) day, as minimum, to fourteen (14) years and eight (8) months, as maximum, and to pay a fine of Three Hundred Thousand Pesos (P300,000.00). The period of detention of the accused should be given full credit. Let the dangerous drugs subject matter of these cases be disposed of in the manner provided by law. The Branch Clerk of Court is directed to transmit the plastic sachets containing shabu subject matter of these cases to the PDEA for said agency's appropriate disposition. The RTC ruled that the prosecution was able to prove beyond reasonable doubt the guilt of the appellants. WHEREFORE, the appeal is hereby DENIED. The CA ruled that the prosecution was able to establish the key elements for illegal possession and sale of dangerous drugs, and that the bare denials of the appellants cannot prevail over the positive testimonies of the police officers. It also held that the failure of the prosecution to show that the police officers conducted the required physical inventory and take the photograph of the objects confiscated does not ipso facto render inadmissible in evidence the items seized. THE TRIAL COURT GRAVELY ERRED IN GIVING CREDENCE TO THE PROSECUTION WITNESSES' INCREDULOUS TESTIMONIES. THE TRIAL COURT GRAVELY ERRED IN FINDING THE ACCUSED­-APPELLANTS GUILTY OF THE CRIMES CHARGED DESPITE THE POLICE OFFICERS' NON-COMPLIANCE WITH SECTION 21 OF REPUBLIC ACT NO. 9165 AND ITS IMPLEMENTING RULES AND REGULATIONS. THE TRIAL COURT GRAVELY ERRED IN ADMITTING THE ALLEGEDLY SEIZED DRUGS DESPITE THE POLICE OFFICERS' FLAWED MANNER IN THE CONDUCT OF INVENTORY AND MARKING THE SAME. THE TRIAL COURT GRAVELY ERRED IN CONVICTING THE ACCUSED-APPELLANTS DESPITE THE PROSECUTION'S FAILURE TO ESTABLISH EVERY LINK IN THE CHAIN OF CUSTODY OF THE ALLEGEDLY SEIZED ITEMS. Appellants argue that it is difficult to believe the testimonies of the police officers because it is impossible for appellants to engage in drug transactions in the middle of the street, under broad daylight, and in the presence of strangers. They also claim that the arresting officers failed to immediately conduct a physical inventory of the seized items and photograph the same in the presence of the accused, their representative or counsel, a representative of the media and the Department of Justice (DOJ), and any elected public official who are required to sign the copies of the inventory. Thus, according to appellants, the prosecution failed to establish every link in the chain of custody of the seized items. 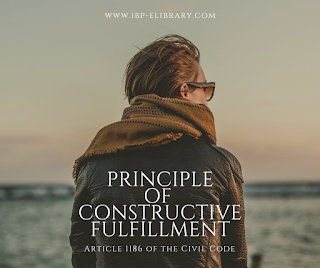 (1) the identity of the buyer and the seller, the object of the sale and its consideration; and (2) the delivery of the thing sold and the payment therefor. In illegal sale of dangerous drugs, it is necessary that the sale transaction actually happened and that "the [procured] object is properly presented as evidence in court and is shown to be the same drugs seized from the accused." the accused was in possession of dangerous drugs;  such possession was not authorized by law; and  the accused was freely and consciously aware of being in possession of dangerous drugs. In both cases involving illegal sale and illegal possession, the illicit drugs confiscated from the accused comprise the corpus delicti of the charges. In People v. Gatlabayan, the Court held that it is of paramount importance that the identity of the dangerous drug be established beyond reasonable doubt; and that it must be proven with certitude that the substance bought during the buy-bust operation is exactly the same substance offered in evidence before the court. In fine, the illegal drug must be produced before the court as exhibit and that which was exhibited must be the very same substance recovered from the suspect. Thus, the chain of custody carries out this purpose "as it ensures that unnecessary doubts concerning the identity of the evidence are removed." (1) The apprehending team having in trial custody and control of the drugs shall, immediately after seizure and confiscation, physically inventory and photograph the same in the presence of the accused or the person/s from whom such items were confiscated and/or seized, or his/her representative or counsel, a representative from the media and the Department of Justice (DOJ), and any elected public official who shall be required to sign the copies of the inventory and be given a copy thereof. (1) The apprehending team having initial custody and control of the dangerous drugs, controlled precursors and essential chemicals, instruments/paraphernalia and/or laboratory equipment shall, immediately after seizure and confiscation, conduct a physical inventory of the seized items and photograph the same in the presence of the accused or the person/s from whom such items were confiscated and/or seized, or his/her representative or counsel, with an elected public official and a representative of the National Prosecution Service or the media who shall be required to sign the copies of the inventory and be given a copy thereof: Provided, That the physical inventory and photograph shall be conducted at the place where the search warrant is served; or at the nearest police station or at the nearest office of the apprehending officer/team, whichever is practicable, in case of warrantless seizures: Provided, finally That noncompliance of these requirements under justifiable grounds, as long as the integrity and the evidentiary value of the seized items are properly preserved by the apprehending officer/team, shall not render void and invalid such seizures and custody over said items. In her Sponsorship Speech on Senate Bill No. 2273, which eventually became R.A. No. 10640, Senator Grace Poe admitted that "while Section 21 was enshrined in the Comprehensive Dangerous Drugs Act to safeguard the integrity of the evidence acquired and prevent planting of evidence, the application of said Section resulted in the ineffectiveness of the government's campaign to stop increasing drug addiction and also, in the conflicting decisions of the courts." Specifically, she cited that "compliance with the rule on witnesses during the physical inventory is difficult. For one, media representatives are not always available in all corners of the Philippines, especially in more remote areas. For another, there were instances where elected barangay officials themselves were involved in the punishable acts apprehended." In addition, "[t]he requirement that inventory is required to be done in police station is also very limiting. Most police stations appeared to be far from locations where accused persons were apprehended." Numerous drug trafficking activities can be traced to operations of highly organized and powerful local and international syndicates. The presence of such syndicates that have the resources and the capability to mount a counter-assault to apprehending law enforcers makes the requirement of Section 21(a) impracticable for law enforcers to comply with. It makes the place of seizure extremely unsafe for the proper inventory and photograph of seized illegal drugs. Section 21(a) of RA 9165 needs to be amended to address the foregoing situation. We did not realize this in 2002 where the safety of the law enforcers and other persons required to be present in the inventory and photography of seized illegal drugs and the preservation of the very existence of seized illegal drugs itself are threatened by an immediate retaliatory action of drug syndicates at the place of seizure. The place where the seized drugs may be inventoried and photographed has to include a location where the seized drugs as well as the persons who are required to be present during the inventory and photograph are safe and secure from extreme danger. It is proposed that the physical inventory and taking of photographs of seized illegal drugs be allowed to be conducted either in the place of seizure or at the nearest police station or office of the apprehending law enforcers. The proposal will provide effective measures to ensure the integrity of seized illegal drugs since a safe location makes it more probable for an inventory and photograph of seized illegal drugs to be properly conducted, thereby reducing the incidents of dismissal of drug cases due to technicalities. Non-observance of the prescribed procedures should not automatically mean that the seizure or confiscation is invalid or illegal, as long as the law enforcement officers could justify the same and could prove that the integrity and the evidentiary value of the seized items are not tainted. This is the effect of the inclusion in the proposal to amend the phrase "justifiable grounds." There are instances wherein there are no media people or representatives from the DOJ available and the absence of these witnesses should not automatically invalidate the drug operation conducted. Even the presence of a public local elected official also is sometimes impossible especially if the elected official is afraid or scared. The Court, however, clarified that under varied field conditions, strict compliance with the requirements of Section 21 of RA 9165 may not always be possible. In fact, the Implementing Rules and Regulations (IRR) of RA 9165 - which is now crystallized into statutory law with the passage of RA 10640 - provide that the said inventory and photography may be conducted at the nearest police station or office of the apprehending team in instances of warrantless seizure, and that non-compliance with the requirements of Section 21 of RA 9165 - under justifiable grounds - will not render void and invalid the seizure and custody over the seized items so long as the integrity and evidentiary value of the seized items are properly preserved by the apprehending officer or team. Tersely put, the failure of the apprehending team to strictly comply with the procedure laid out in Section 21 of RA 9165 and the IRR does not ipso facto render the seizure and custody over the items as void and invalid, provided that the prosecution satisfactorily proves that: (a) there is justifiable ground for non­compliance; and (b) the integrity and evidentiary value of the seized items are properly preserved. In People v. Almorfe, the Court stressed that for the above-saving clause to apply, the prosecution must explain the reasons behind the procedural lapses, and that the integrity and value of the seized evidence had nonetheless been preserved. Also, in People v. De Guzman, it was emphasized that the justifiable ground for non-compliance must be proven as a fact, because the Court cannot presume what these grounds are or that they even exist. Under the original provision of Section 21, after seizure and confiscation of the drugs, the apprehending team was required to immediately conduct a physically inventory and photograph of the same in the presence of (1) the accused or the person/s from whom such items were confiscated and/or seized, or his/her representative or counsel, (2) a representative from the media and (3) the DOJ, and (4) any elected public official who shall be required to sign the copies of the inventory and be given a copy thereof. It is assumed that the presence of these three persons will guarantee "against planting of evidence and frame up," i.e., they are "necessary to insulate the apprehension and incrimination proceedings from any taint of illegitimacy or irregularity." Now, the amendatory law mandates that the conduct of physical inventory and photograph of the seized items must be in the presence of (1) the accused or the person/s from whom such items were confiscated and/or seized, or his/her representative or counsel, (2) with an elected public official, and (3) a representative of the National Prosecution Service or the media who shall sign the copies of the inventory and be given a copy thereof. In this case, the absence of a representative of the National Prosecution Service or the media during the inventory of the seized items was not justifiably explained by the prosecution. A review of the Transcript of Stenographic Notes does not yield any testimony from the arresting officers as to the reason why there was no representative from the DOJ or the media. The only one present to witness the inventory and the marking was an elected official, Barangay Captain Evelyn Villamor. Neither was there any testimony to show that any attempt was made to secure the presence of the required witness. x x x It must be emphasized that the prosecution must able to prove a justifiable ground in omitting certain requirements provided in Sec. 21 such as, but not limited to the following: 1) media representatives are not available at that time or that the police operatives had no time to alert the media due to the immediacy of the operation they were about to undertake, especially if it is done in more remote areas; 2) the police operatives, with the same reason, failed to find an available representative of the National Prosecution Service; 3) the police officers, due to time constraints brought about by the urgency of the operation to be undertaken and in order to comply with the provisions of Article 125 of the Revised Penal Code in the timely delivery of prisoners, were not able to comply with all the requisites set forth in Section 21 of R.A. 9165. The prosecution never alleged and proved that the presence of the required witnesses was not obtained for any of the following reasons, such as: (1) their attendance was impossible because the place of arrest was a remote area;·(2) their safety during the inventory and photograph of the seized drugs was threatened by an immediate retaliatory action of the accused or any person/s acting for and in his/her behalf; (3) the elected official themselves were involved in the punishable acts sought to be apprehended; (4) earnest efforts to secure the presence of a DOJ or media representative and elected public official within the period required under Article 125 of the Revised Penal Could prove futile through no fault of the arresting officers, who face the threat of being charged with arbitrary detention; or (5) time constraints and urgency of the anti-drug operations, which often rely on tips of confidential assets, prevented the law enforcers from obtaining the presence of the required witnesses even before the offenders could escape. Certainly, the prosecution bears the burden of proof to show valid cause for non-compliance with the procedure laid down in Section 21 of R.A. No. 9165, as amended. It has the positive duty to demonstrate observance thereto in such a way that, during the proceedings before the trial court, it must initiate in acknowledging and justifying any perceived deviations from the requirements of the law. Its failure to follow the mandated procedure must be adequately explained and must be proven as a fact in accordance with the rules on evidence. The rules require that the apprehending officers do not simply mention a justifiable ground, but also clearly state this ground in their sworn affidavit, coupled with a statement on the steps they took to preserve the integrity of the seized item. 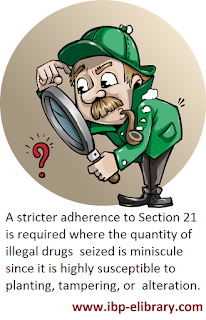 A stricter adherence to Section 21 is required where the quantity of illegal drugs seized is miniscule since it is highly susceptible to planting, tampering, or alteration. Thus, this Court finds it appropriate to acquit the appellants in this case as their guilt has not been established beyond reasonable doubt. The resolution of the other issues raised by appellants is no longer necessary. WHEREFORE, premises considered, the Decision dated May 31, 2017 of the Court of Appeals in CA-G.R. CR-HC No. 08121 dismissing appellants' appeai and affirming the Decision dated October 28, 2015 of the Regional Trial Court, Branch 65, Makati City is REVERSED AND SET ASIDE. Appellants Emmanuel Oliva y Jorjil, Bernardo Barangot y Pilais, Mark Angelo Manalastas y Gapasin are ACQUITTED for failure of the prosecution to prove their guilt beyond reasonable doubt. They are ORDERED IMMEDIATELY RELEASED from detention, unless they are confined for any other lawful cause. Let entry of final judgment be issued immediately. Let a copy of this Decision be furnished to the Director of the Bureau of Corrections and the Superintendent of the New Bilibid Prisons, for immediate implementation. Said Director and Superintendent are ORDERED to REPORT to this Court within five (5) working days from receipt of this Decision the action he/she has taken. Leonen, Hernando, and Carandang,* JJ., concur. A. Reyes, Jr., JJ., on leave. Please take notice that on January 7, 2019 a Decision, copy attached hereto, was rendered by the Supreme Court in the above-entitled case, the original of which was received by this Office on January 15, 2019 at 3:08 p.m.
"WHEREFORE, premises considered, the Decision dated May 31, 2017 of the Court of Appeals in CA-G.R. CR-HC No. 08121 dismissing appellant appeal and affirming the Decision dated October 28, 2015 of the Regional Trial Court, Branch 65, Makati City is REVERSED and SET ASIDE. Appellants Emmanuel Oliva y Jorjil, Bernardo Barangot y Pilais, Mark Angelo Manalastas y Gapasin are ACQUITTED for failure of the prosecution to prove their guilt beyond reasonable doubt. They are ORDERED IMMEDIATELY RELEASED from detention, unless they are confined for any other lawful cause. Let entry of judgment be issued immediately. NOW, THEREFORE, You are hereby ordered to immediately release EMMANUEL OLIVA y JORJIL, BERNARDO BARANGOT y PILAIS and MARK ANGELO MANALASTAS y GAPASIN unless there are other lawful causes for which they should be further detained, and to return this Order with the certificate of your proceedings within five (5) days from notice hereof. GIVEN by the Honorable DIOSDADO M. PERALTA, Chairperson of the Third Division of the Supreme Court of the Philippines, this 7th day of January 2019. * Designated Additional Member per Special Order No. 2624 dated November 28, 2018. Penned by Associate Justice Danton Q. Bueser with Associate Justices Apolinario D. Bruselas, Jr. and Marie Christine Azcarraga-Jacob concurring; rollo, pp. 2-14. Penned by Presiding Judge Edgardo M. Caldona; CA rollo, pp. 17-25. People v. Ismael, G.R. No. 208093, February 20, 2017, 818 SCRA 122, 131-132. 699 Phil. 240, 252 (2011). People v. Mirondo, 771 Phil. 345, 356-357 (2015). See People v. Ismael, supra note 10, at 132. AN ACT TO FURTHER STRENGTHEN THE ANTI-DRUG CAMPAIGN OF THE GOVERNMENT, AMENDING FOR THE PURPOSE SECTION 21 OF REPUBLIC ACT NO. 9165, OTHERWISE KNOWN AS THE "COMPREHENSIVE DANGEROUS DRUGS ACT OF 2002." Senate Journal. Session No. 80, 16th Congress, 1st Regular Session, June 4, 2014, p. 348. G.R. No. 229671, January 31, 2018. See also People v. Paz, G.R. No. 229512, January 31, 2018; People v. Mamangon, G.R. No. 229102, January 29, 2018; People v. Jugo, G.R. No. 231792, January 29, 2018; People v. Calibod, G.R. No. 230230, November 20, 2017: People v. Ching, G.R. No. 223556, October 9, 2017; People v. Geronimo, G.R. No. 225500, September 11, 2017; People v. Ceralde, G.R. No. 228894, August 7, 2017; and People v. Macapundag, G.R. No. 225965, March 13, 2017, 820 SCRA 204. People v. Sagana, G.R. No. 208471, August 2, 2017. G.R. No. 219953, April 23, 2018. Article 125. Delay in the delivery of detained persons to the proper judicial authorities. - The penalties provided in the next preceding article shall be imposed upon the public officer or employee who shall detain any person for some legal ground and shall fail to deliver such person to the proper judicial authorities within the period of; twelve (12) hours, for crimes or offenses punishable by light penalties, or their equivalent; eighteen (18) hours, for crimes or offenses punishable by correctional penalties, or their equivalent and thirty·six (36) hours, for crimes, or offenses punishable by afflictive or capital penalties, or their equivalent. In every case, the person detained shall be informed of the cause of his detention and shall be allowed upon his request, to communicate and confer at any time with his attorney or counsel. (As amended by E.O. Nos. 59 and 272, Nov. 7, 1986 and July 25, 1987, respectively). G.R. No. 224290, June 11, 2018. See People v. Macapundag, supra note 16, at 214. See People v. Miranda, G.R. No. 229671, January 31, 2018; People v. Paz, G.R. No. 229512, January 31, 2018; People v. Mamangon, G.R. No. 229102, January 29, 2018; and People v. Jugo, G.R. No. 231792, January 29, 2018. People v. Saragena, G.R. No. 210677, August 23, 2017. See People v. Abelarde, G.R. No. 215713, January 22, 2018; People v. Macud, G.R. No. 219175, December 14, 2017; People v. Arposeple, G.R. No. 205787, November 22, 2017; Aparente v. People, G.R. No. 205695, September 27, 2017; People v. Cabellon, G.R. No. 207229, September 20, 2017; People v. Saragena, G.R. No. 210677, August 23, 2017; People v. Saunar, G.R. No. 207396, August 9, 2017; People v. Sagana, G.R. No. 208471, August 2, 2017; People v. Segundo, G.R. No. 205614, July 26, 2017; and People v. Jaafar, G.R. No. 219829, January 18, 2017, 815 SCRA 19, 33.